How to Differentiate - Are YOU Different ? My colleague Kelli Hatton of fitmarc shared this video on the book "Different". The book addresses, in a unique way, how to differentiate your business. But its more than that really. Its about transparency, meaning, purpose and the essence of being and doing what is important. XPLANE partnered with Youngme Moon of the Harvard Business School to create a powerful video that promotes the release of the book. 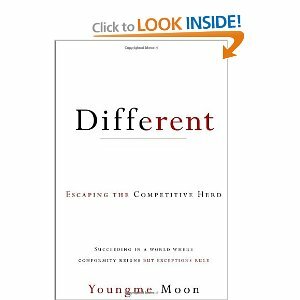 Moon’s book challenges us to consider the meaning of business differentiation and what it takes to be different in a way that actually MAKES a difference. Watch the 3 minute video to learn more and read it !